madly off in all directions: What Happened to Hallowe'en? Over the week-end, I did a little preparation for Christmas and Easter (I think). That's three hyacinths and five paperwhites. 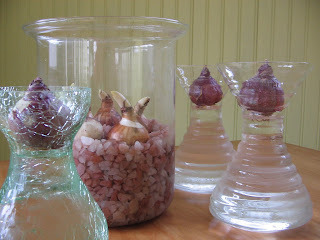 The paperwhites should be ready in time for Christmas, the hyacinths take longer, at least Valentine's, if not Easter. I always find in hard to judge just how fast bulbs will grow. Some years I've been exactly right, some years I'm way off. Curiously, I always start them the week after my birthday. I suppose there are other factors that I haven't accounted for. I've planted it on the south side of the garden, and it should get full sun through the morning and filtered light in the afternoon. I'm not sure how long it's going to take to mature, at least three years I would think. I'll keep you posted on it's progress. I'm beginning to panic at how little I've done for Hallowe'en (one of my favourite holidays). Only a little bit of decorating and almost no work put into costumes yet. Yikes! I'm going to have to get cracking. My next post, absolutely, will have to be about spookiness. Do you really make money from them? Some just give points to redeem. Careful Penny. I had no recollection who Tara was, so went to look at the website she suggested. I had all kinds of computer troubles afterward and Nigel had to run a scan. Elly says Tara is a javabot. Beware! Spooky! Hello all! I've deleted Tara's comment and refused her entry to my blog. We're all safe again! 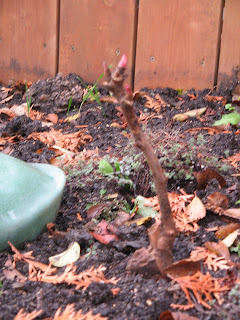 Are tree peonies hardy in Winnipeg? Oh Andrea, you're cruel. You had me in a brief panic there, but yes, if you check the Vesey's site, this one is good for zone 3a and warmer (that includes us). Hooray for genetic engineering! I love peonies. I have 3 plants in my backyard, plus one that's called a Fern Peonie. It's really beautiful, the flowers are smaller, a bright dark red. The leaves are like a dill plant.